Joe B.’s ultimate guitar safari...introducing The Bosco Burst! Thread: Joe B.’s ultimate guitar safari...introducing The Bosco Burst! Re: Joe B.’s ultimate guitar safari...introducing The Bosco Burst! thats what i thought! the guitar is a rebel! Look at the clip on the pickguard and then shoot yourself the bird in a mirror. I think you’ll figure it out then. Or alternatively the Birdburst........there's a nice bit of alliteration with that. With respect, Having never been in the same room as a burst I wonder, the more bursts you play, do you discover how similar they all are or how different they all are to each other? Visual differences aside, talking sound and feel. Just saw the video of Joe on facebook playing Bosco for the first time prompted me to ask. Another nice find. Congrats Joe! Different in feel, operation(when you're trying to find the 'sweet spot' in each one) and sound in some or most cases. Pretty much the same as playing a number of acoustic guitars of the same make and model from different years. Super nice color on that one! It will only sound better after some stage time. I don't see the tailpiece ground wire or the hole from the cavity. Did somebody remove the ground and the hole is not visible in the photo? What amp is he playing? Nice sound. I'm waiting to give Joe that pleasure. Hell...the hunt is half the fun! It's been a while since I've visited here... However I am quite familiar with this story, as part of the "safari" , is a connection here on Long Island, NY. ......And out of an incredible abundance of respect for Mr. B. I also, will wait for him to tell the story. Just an amazing instrument.. Congrat's Mr. Bonamassa! It looks like the old Deluxe he uses a lot in his demos at home. It's been painted black. He did say somewhere what year it was, I think he said 1955 and that it has a 70's blackback Celestion G12M fitted. Then again, I could be wrong! 13 gauge strings on an old Guitar..... wow. Les Paul Deluxe was my first serious guitar, age 16 yrs old purchased out of a guys car for $300 (pounds) in 1980, Leeds UK. Yeah, I think you are right! How many guitars total (roughly) and how many amps? "Do you call sleeping with a guitar in your hands practicing?" "It is if you don't drop it." - Trent Lane, Daria, Episode 1-2.
flatwounds.. this guy was old school. prolly more into chet than bloomfield. seems like a lot of 58's look really cool! to me anyway. is it a 58? They all came stock with Flatwounds in the Fifties! As I remember reading many years ago George and John would put flatwounds on their guitars when recording........don't know if their was any truth to that or not but their recorded sound was good and clean for sure. Wow, Sweet Burst, those PAFs sound really full throated. It’s so good seeing these great instruments go to someone who will play them and in JBs’s case play them very very well. “I just happened to have some spare tuners in my spare tire kit.” Lol The vintage guitar McGuyver. Man, such a cool guitar. I can’t even imagine. I wonder how much time passed between Joe getting word on this guitar and pulling into the guys driveway? Congrats on another insanely awesome guitar. Yes they did! They used strings provided by Selmer's which were actually Pyramid's. Pyramid's are made in Germany. Some of the Gibson Strings were made by Pyramid as well. there's documentation at the Pyramid Factory from Gibson, Gretsch & Guild Guitars that show order's for 1,000's of sets during the `50's & `60's into the mid- `70's. any string labeled "Selmer" sold in the U.K. was made by Pyramid! I have sets of Gibson strings [from the 60's, maybe 50's] marked made in Germany. PS: The original photos in black and white helped too. Last edited by JBLPplayer; 02-19-19 at 01:26 AM. Cool story , Glad to see JB owning this guitar . The guitar Ambassador Joe is the guy !!! Congratulation to a spectacular find!! Great story and I agree on the colour, magical! And the sound in your hands too.. It reminds me of the dark burst Koss played on Mr. Big video. Enjoy in good health. Bout to go up to Adirondacks to Snowmobile/Ski. N.Y. pride. I own 12 of them now. 9-0378, 9-0829, 9-0917, 9-1948, 9-1951, 0-0162, 0-1491, 0-7171, 0-7452, 0-7453, 0-8089 and 0-8145? Last edited by viper007; 02-20-19 at 02:03 PM. Honestly, just from that small clip on instagram I get the feeling that this burst sounds really really darn good. Congrats! There is NO substitute for Loudness. Thank you JBLPlayer for filling in the details. My dear friend Ed Clark had sent me the pic of the guitar prior to sale . When Ed told me who he suggested to Al, for a potential buyer, of course, I couldn't have agreed more wholeheartedly. Al had graciously offered Ed, 2 of the VIP passes if he could make it to FLA.
We both stayed at Al's house, who is an absolute "old school" gentleman, while we were down in Florida. Thank you again, for the tickets ,and the opportunity to shake your hand after the show. As tired as you probably were, it was obvious you would talk guitars all night! lol. So once again, congratulations MR B. The Bosco Burst couldn't be in better custodial hands.. Being a small part of this has been an amazing experience. P.S., In one of the B & W photos I noticed the metal pick guard thingy was not there.. Have a look again. Last edited by joemags54; 02-25-19 at 10:13 AM. Congrats Joe! She’s a beauty! Beautiful guitar in great condition. Love the color! 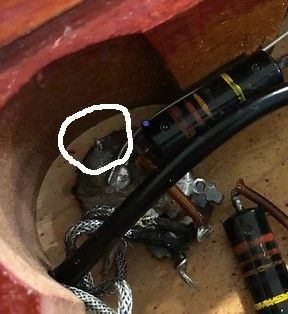 Ground wire from the bridge pickup cavity? If you look closely you can see the ground wire. It breaks thru the maple right on the 90 degree edge of the 1" Fostner bore. I have no idea what a "Foster bore" is or what you are talking about. It would be better to use the full size photo rather than the tiny version. I still don't see the ground wire going to the tailpiece or the bridge. 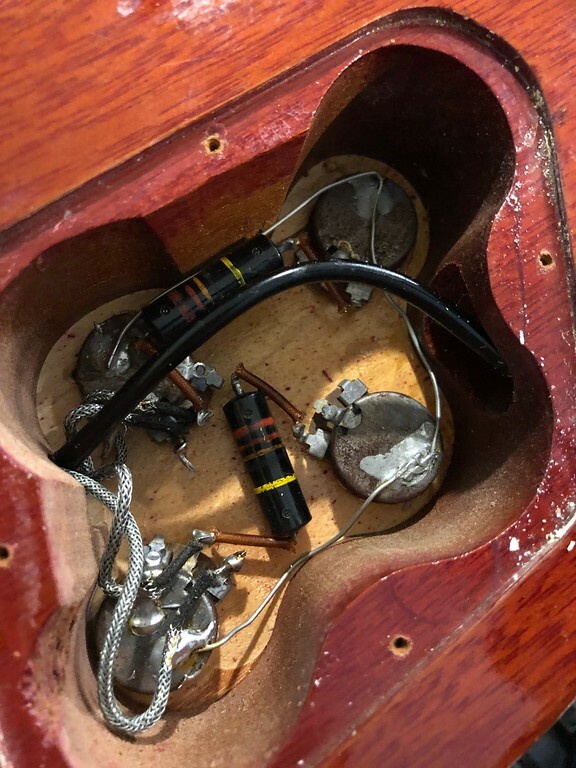 I think this is the ground wire to the tailpiece. I have watched egg layin on a full moon,, there. Whoa.